There is growing frustration that a very low unemployment rate has not yet resulted in an acceleration in wage growth. This is true whether one looks at Average Hourly Earnings, the Employment Cost Index or the Atlanta Fed Wage Tracker. The latest reading is Average Hourly Earnings for June which increased by only 2.74% year-on-year, which was slightly less than May. Another perspective on sustained moderation in Average Hourly Earnings is that the average monthly percent change for the first six months of this year is 0.21%, slightly ahead of the 0.20% average in the first six months of 2017 but short of the 0.22% average monthly increase for the first six months of 2016 (see Chart 1). Our view has always been that subdued wage inflation results from there being more slack in the labor market than commonly perceived, a view confirmed by the June increase in the labor force of 601,000. Such a large gain contradicts the view that the US is at full employment. As we have stated several times before, population ageing in developed countries means that the “full employment unemployment rate”, otherwise known as NAIRU, is lower than it was – our estimate for the US is that NAIRU has a 3 handle. 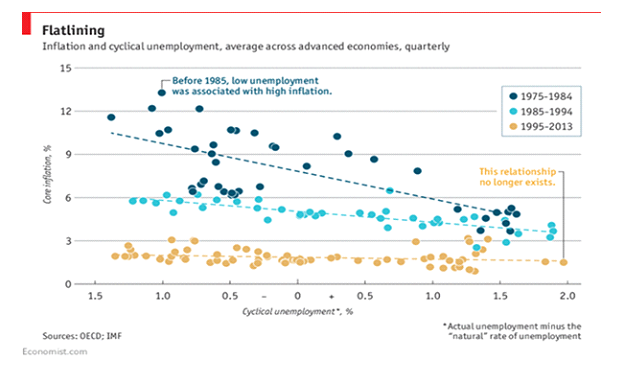 A lower developed world NAIRU, therefore, explains why wage inflation is so moderate even with low unemployment (see Chart 2). 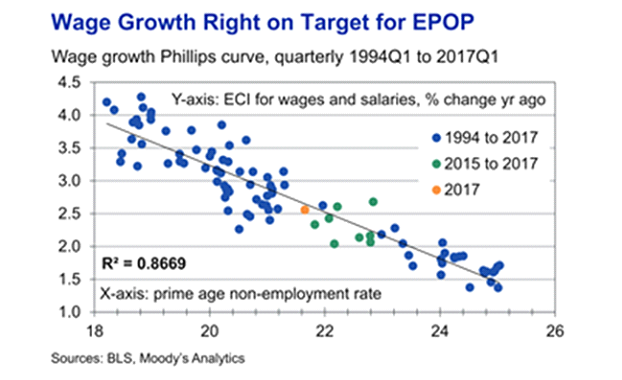 Although many have interpreted this as affirming that the Philipp’s Curve is dead, that is not the case since that affirmation is based on an incorrect calculation of NAIRU. In the 1960s and 70s, there was a lack of recognition that the entry of young baby boomers meant that NAIRU was higher than perceived. Now, ageing baby boomers mean that NAIRU is lower than commonly perceived. A perspective that the relationship between wages and the labor market is not totally defunct, however, is seen in the relationship between the prime age non-employment rate and the Employment Cost Index (see Chart 3). 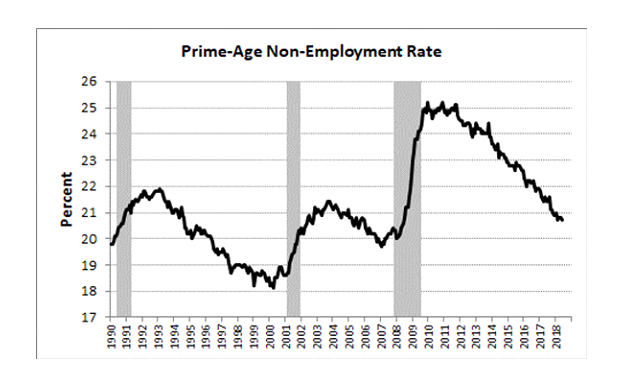 The June value for the prime age non-employment rate continues to confirm continued moderation in wages (see Chart 4). If the ongoing trade war becomes even more serious and results in layoffs there is a risk that NAIRU may never be tested. Otherwise, the absence of accelerating wage growth and more workers coming into the labor force raises the case for slower rate hikes by the Fed.